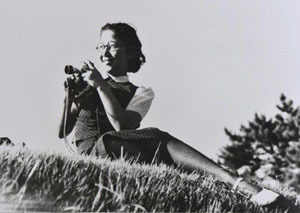 At 96, Tsuneko Sasamoto, Japan’s first female photojournalist, remains a remarkable force of energy, creativity and inspiration. Dubbed a “plucky pioneer” and “the Annie Liebovitz of her day,” Sasamoto has photographed some of Japan’s greatest personalities and historical moments during her 70-year career. 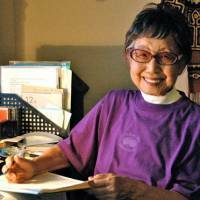 Though widely published in Japan, she is a hidden gem for international audiences. “She saw Showa,”an upcoming exhibition of her postwar Showa Era images from 1945-1958 at Cosmo Gallery in Kamimeguro, is an excellent opportunity to learn about this extraordinary woman. 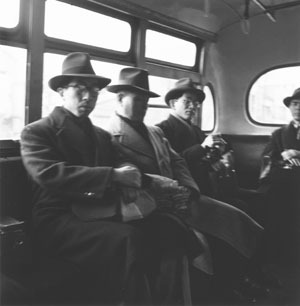 Organized by writer Kate Klippensteen and her partner, photographer Yasuo Konishi, the works on display reveal Sasamoto’s distinctive documentary style and natural approach to portraiture, which was unique among her male counterparts of the day. Like any pioneer, Sasamoto is no stranger to challenges. Her life has not been easy. “Originally I wanted to be a painter,” she recalls. “But my father didn’t allow it, saying, ‘It’s not what a woman should be.’ ” She tried college, but dropped out and then pursued illustration and pattern-making; the start of her long love for fashion. It was a black-and-white film by Man Ray she saw with a friend in 1937 that sparked her interest in photography. Photojournalists covering the fast-paced news stories at that time often struggled with primitive equipment. The single-lens reflex camera was not yet commonly used and distances had to be measured manually. Flash photography was a one-shot deal, as bulbs had to be changed for each picture. Despite the technical difficulties, Sasamoto found clever ways to photograph difficult moments, making the most of her wit, naivete and sheer guts. Endowed with a razor-sharp memory, she can still recall those moments with startling clarity. Dwuring an assignment in 1940 to photograph a group of Hitler Youth visiting Japan’s countryside, Sasamoto and her male colleagues neglected to bring their flash equipment, assuming all the shots would be outside. As the Hitler Youth nibbled on potatoes with local farmers in a dark hut, the photographers stood outside helpless, missing the historic moment. She also worked her charm on Japan’s new chief, Gen. Douglas MacArthur and his wife Jean at a silk exhibition in 1947. As the couple wove their way through the show, with the press following their every move, the petite Sasamoto jostled through the crowd of male photographers to get her shot. 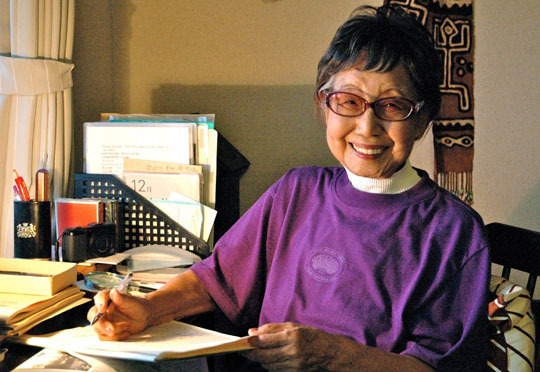 Sasamoto’s boundless energy and commitment to her craft have brought her far. In 2007, at the age of 93, she lectured at universities in Paris and Tunisia. This year she will be heading to New York City for an assignment, appropriately, on women professionals. 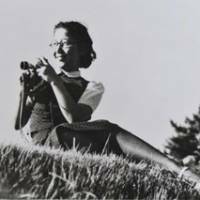 “She Saw Showa: Postwar Perspectives by Tsuneko Sasamoto, 96, Japan’s First Woman Photojournalist” at Gallery Cosmos runs Sept. 28-Oct. 5; admission free; open daily 11:30 a.m.-6:30 p.m. (Mon., holidays and the last day of exhibition till 3 p.m.). For more information, visit www.gallerycosmos.com.